Yesterday, it was announced that Embery-Simpson, a Midwest City native, would continue his playing career at the University of Tulsa, removing one player from my list above. However, it looks as though there will be someone to quickly replace his spot in my rankings. 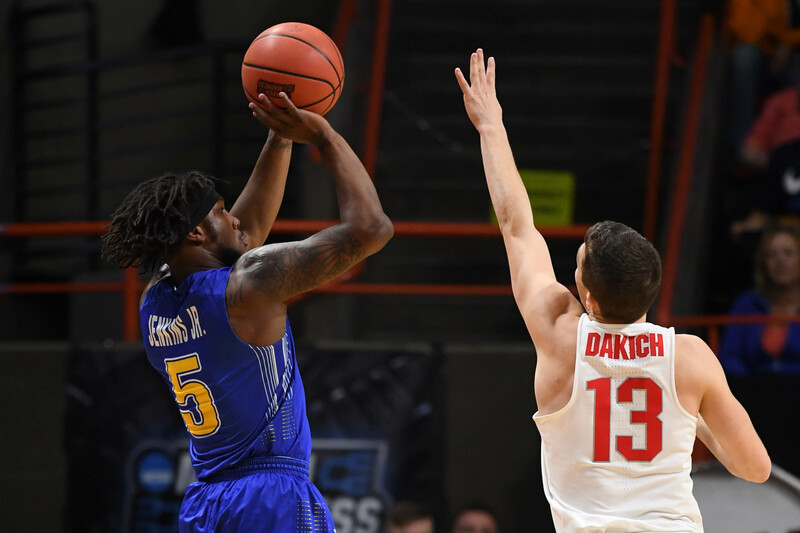 On Monday, South Dakota State guard David Jenkins Jr. took to Twitter to announce that he would be exploring the transfer market due to recent coaching changes at SDSU. Shortly after that, Ellie Liberman of SBNation’s Mid-Major Madness and StockRisers.com, broke the news that Jenkins Jr. had been contacted by OSU, along with other schools such as Arizona, Cincinnati, Gonzaga, Kansas, Memphis, Nevada, Notre Dame, TCU and UNLV. The Tacoma, Washington product averaged 19.7 points, 3.4 rebounds and 1.6 assists per game last season for the Jackrabbits as a sophomore. He shot 45.8 percent from the field and an outstanding 45.3 percent from three-point range on 7.7 attempts per game. Jenkins Jr. would have to sit out a year due to NCAA transfer rules, but he would have two seasons of eligibility remaining. Additionally, due to the coaching change, he would most likely submit a waiver to try and gain early eligibility and suit up at the end of the fall semester. The former three-star recruit is a combo guard at 6-2, 200 pounds, who has great speed and is able to create for himself off the dribble. He works great in the pick and roll, and would fit perfect in these situations with current Cowboys Cam McGriff and Yor Anei, and is an all around great facilitator with good court vision. Additionally, as I noted above, he is an elite shooter who can get off shots from pretty much anywhere with his quick release. On the defensive end of the floor, Jenkins uses his long arms to his advantage by playing up in the passing lanes, something else I’m sure Boynton loves to see on film, and has a solid enough frame to hold his own against bigger guards. I realize the competition in the Summit League isn’t up to par with the Big 12, but Jenkins has played against higher level talent and performed well. He had scoring outings of 35 against Memphis and 31 against Colorado during his time at SDSU. Personally, I would move Jenkins Jr. up to No. 2 on my list above, just behind Kira Lewis. He would be a huge pickup for the Pokes, especially if they aren’t able to land 2019 high school prospect Chris Harris Jr.